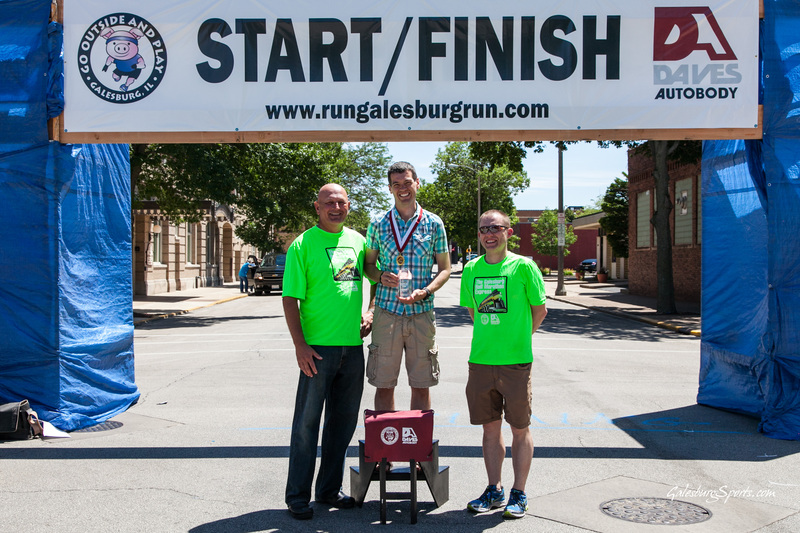 Sunday was the Galesburg Half Marathon Express. 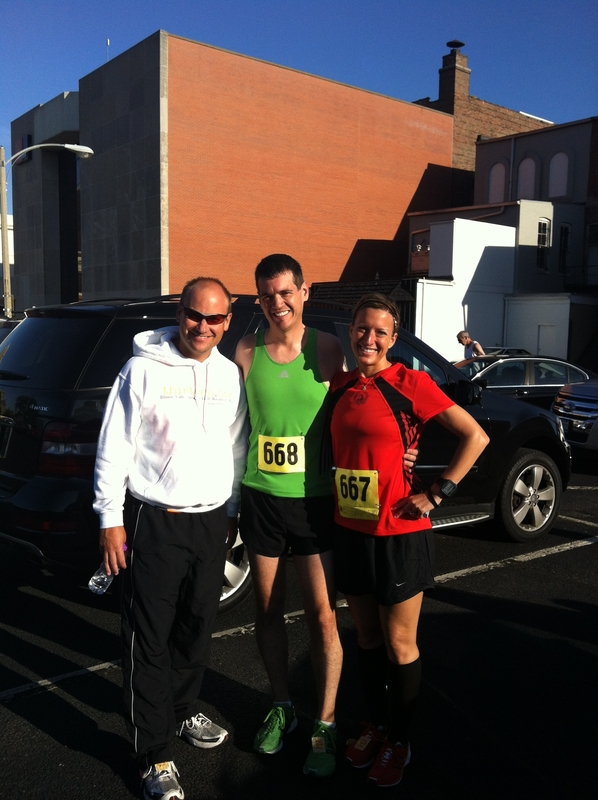 This race is near my husband’s hometown so we were excited to participate in this inaugural event. We would have family and friends at the race, some who were racing their first half marathon, which is always great to see. We were able to get parking easily and pick up our packets race morning. This race wins “most interesting goodie bag” so far. 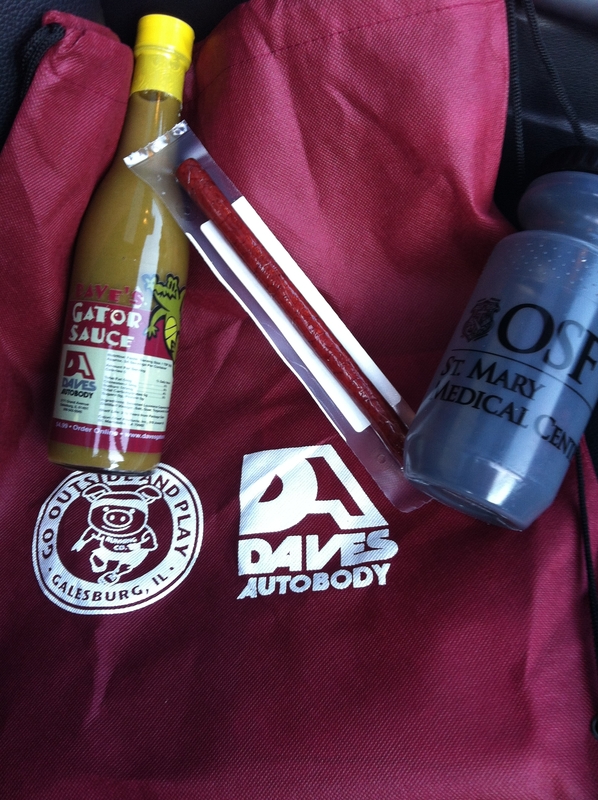 We received a tech shirt, water bottle, Gator Sauce, and a beef stick (from a local proprieter). I had positive thoughts about this race and being able to be somewhere in a respectable 5-10 minutes slower than my PR based on my lower training mileage. But I was having these positive thoughts without regard that at the previous Thursday’s Team Steam workout my piriformis was is major pain and I struggled just to run 3 miles. I did stretching, rolling, trigger point ball to manage it. I was still getting in miles which included 11 miles on Friday, but I was definitely running with pain. So much so that I sat on a trigger point ball for the 1.5 hour drive to this half marathon race. The event had a 5K, Half Marathon and a 1 Mile walk. Approximately 150 of the 700 participants would be half marathoners. With the small field I somehow told myself that I would warm up and keep a slower pace and still survive the hilly race pretty well. Unfortunately that would not be the case. It wasn’t but within the first few miles when we got a bit of incline that I found out quickly how much my piriformis is hurting. This course has hills throughout with a bigger one around mile 8. My pain forced me to a slow pace. The baking hot sun made sure it would feel like a long way to the finish. I was sore and wilted in the sun and vowed to myself to get an appointment for physical therapy and ask for another round of Grastons treatments. Rob finished in 1:41 and got 1st in his age group and I got 2nd in mine! I’m annoyed to deal with this injury, but I need to get it addressed before attempting to train for Chicago Marathon. I’m scheduled to get assessed for physical therapy on Wednesday. In the meantime I am not going to be able to do Team Steam workouts and need to refrain from aggrevating it further with hill work. I will try some light miles flat and hopefully I can at least be okay to keep that going while getting it treated. We will definitely plan to come back to run this race next year though! Great job on finishing the race despite the intense pain. You’re tougher than most. Sounds like Galesburg put on a great event! You’ll be missed at the final Team Steam workouts. Do you still plan to run Steamboat – either the 4 mi or the 15k? boo to that piriformis pain! Sorry to hear about that. Take care of you! 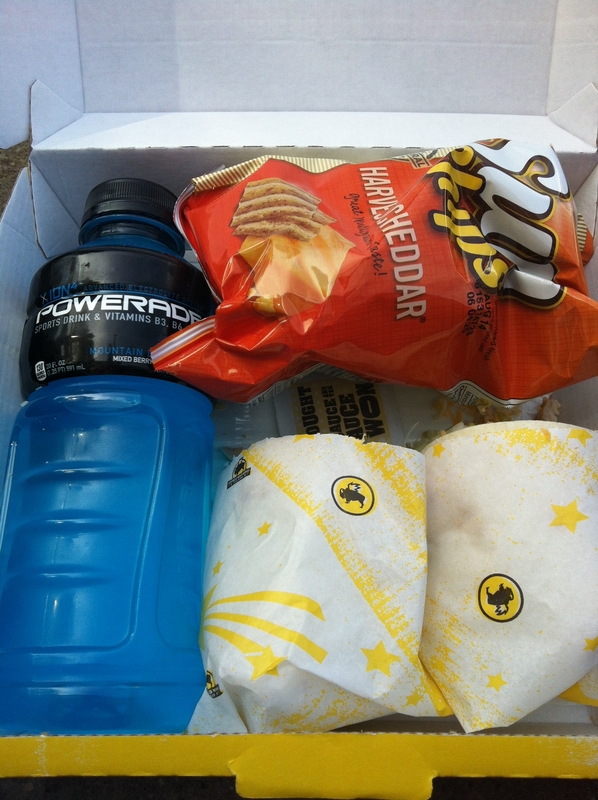 Yum-O to BW’s post-race! Too bad there wasn’t a beer included 😉 I hear ya on the piriformis…what a pain in the a**! Great job though, at least you weren’t in the DNF category! I too am battling piriformis pain, and I participated in this half marathon (powerwalking the whole way). I finished in 2:30, which is 8 minutes slower than my last year’s best. It WAS hot out there and those cobblestones near mile 11 were tricky. Good luck with the piriformis and the Team Steam training. How is the race course? A lot of hills? Where I live we have zero hills so for me I considered the course hilly. It would have been manageable had I not been dealing with a piriformis issue at the time. After the sub division area I remember some country road hills around 8-9 that were pretty steep.